This one comes courtesy one of my favorite sites for healthy food inspiration, DietDoctor.com. When I first got serious about this journey in January, the site was a favorite source for my weekly meal plan brainstorm. The recipe also introduced me to a spice I’d never before used – turmeric. Whether it lives up to all the health hype or not, I’m digging on that golden color! This granola brings together so many favorite ingredients – pecans and almonds and cinnamon spice oh my! And true to the notes from the original recipe, the nuts and seeds used here are indeed heat tolerant. Two 20 minute spells in the oven and not a single piece burned. As someone who has accidentally blackened more than her fair share of “nuts, lightly toasted”, this is cause for jiggity jig joy around the kitchen island. Spread out on a baking sheet lined with parchment paper. Roast in the oven for 20 minutes. Remove from the oven and stir. Roast 20 minutes more. Remove from heat and cool. Store in air tight container. 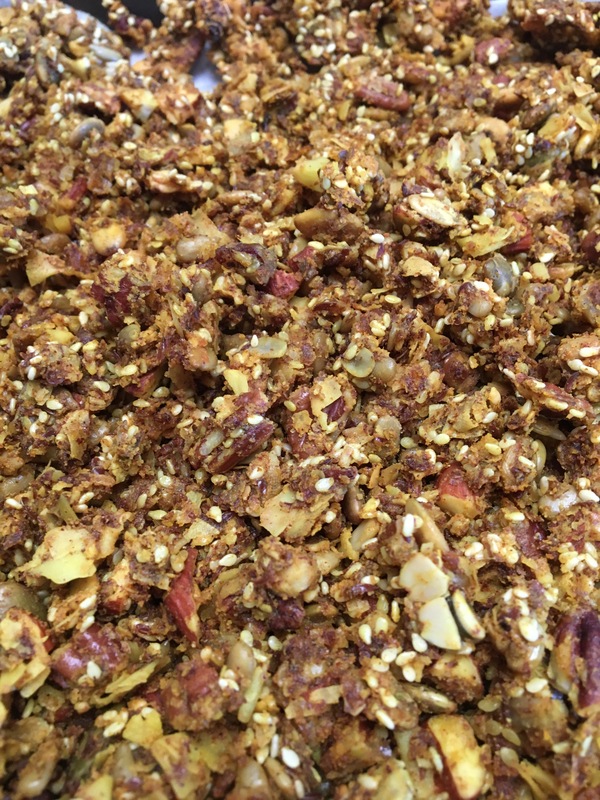 MFP entry: Homemade Granola, 1/2 cup serving (does not include yogurt or honey), 312 cals.